Rural and Regional Development Deputy Minister Datuk Alexander Nanta Linggi told the Dewan Rakyat that the entrepreneurs in the existing malls have been doing well. He said the government does not want the Bumiputera to be left behind in ICT-related businesses, considering that they are also the biggest buyers of ICT gadgets. “The digital economy is growing rapidly, and while the government supports many local and foreign e-commerce players in our country, we need to make sure the Bumiputeras are not left behind,” Linggi said, responding to Jeff Ooi Chuan Aun (DAP-Jelutong), who asked about the business volume in Mara Digital Mall to date. He also said the government has assisted the Bumiputera entrepreneurs in Mara Digital Mall in many ways, including waiving rental payments for six months for the traders at the malls and to help them consolidate their finances before starting to pay rent. He added that the government will also be assisting them to keep up with the competition from international e-commerce giants like Alibaba. “We will also cooperate with Malaysia International Trade and Industry (Miti) on getting the Bumiputera entrepreneurs from the Mara Digital Mall to participate in collaborating with other industry players from leading countries like China. “And with this success, many Bumiputera entrepreneurs will be involved in the digital economy and improve their quality and capability in the world of digital economy,” he said. Linggi said customers should not worry about the risk of counterfeit products because the government, through the Domestic Trade, Cooperatives and Consumerism Ministry, will ensure product authenticity. “The ministry will continue to explore opportunities to create at least one Mara Digital Mall in each state and a long-term goal is to expand Mara Digital to the district level, which would be in a smaller scale. “The district level openings would be similar to the ones at Mara arcades,” he said. Linggi said the two upcoming Mara Digital Malls in Malacca and Johor would be operational beginning next year. These malls are in addition to the current four digital malls located in Kuala Lumpur, Shah Alam, Ipoh and Kuantan. “Mara Digital Mall in Kuala Lumpur has been well received based on its recorded sales volume of RM28.3 million since its inception in December 2015. 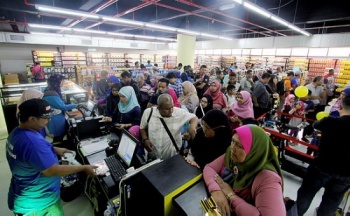 “All 40 space have been fully occupied,” Alexander said, adding that the Shah Alam’s digital mall has made a total sales figure of RM2.3 million since it began operations on July 21, 2016. The Mara Digital Malls in Ipoh just began operations on Oct 12, with the one in Kuantan starting on Oct 29. All their spaces are occupied.